Age of loss + Stage of Emotional Development + the ability of our caretaker or support system to allow us to grieve our loss = Long term adult adaptability. In other words, how emotionally balanced, centered, and adaptable we are as adult. Let’s talk about adolescents who experienced mother loss through death or absence from 13-18 years of age. Of all stages of human development, the adolescent stage has the most emotional developmental tasks to accomplish. When we think of adolescence, the entire stage can be summed up as creating a sense of balance. It is about losing and regaining our equilibrium. We have all been there. Think of each of these developmental tasks being on a continuum. The developmental goal of this stage is to create balance, so somewhere in the center is where we want to be as we exit adolescence. However mother loss during this stage can result in us being stuck in an extreme, on either end. 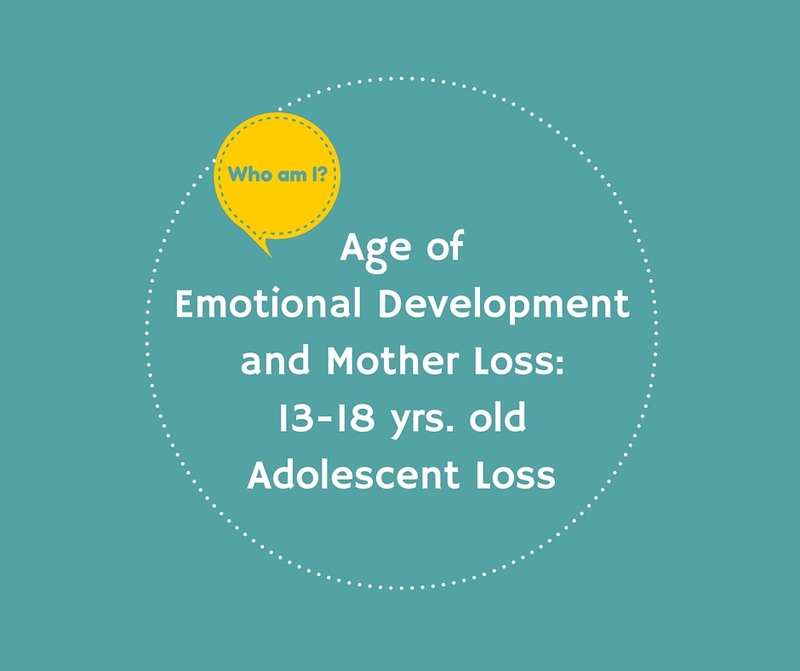 Here are some of the Developmental Tasks that an adolescent has to conquer and can be halted by experiencing mother loss during the ages of 13-18. If you experienced mother loss in your adolescence, circle what you relate to. When a woman has experienced mother loss during this stage, she may spend a great deal of time trying to look “normal” to the outside world. This is common adolescent behavior, but a motherless daughter often works harder at trying to maintain her aura of competence and control. The more composed a teen that has experienced mother loss appears, the greater the risk of experiencing long term, unresolved grief. Adolescents will also try to manufacture a new identity that exists independent of her loss. Susan went away to college after her mother died. Her sister went to visit her in college and no one even knew Susan had a sister or that her mother had died. As Susan and her sister grew into adulthood, they became estranged and eventually got reconnected. Her sister shared that it was a shame that Susan and she were not connected for all of these years. Susan responded that she had closed the door on that chapter of her life and her sister was part of that. She had worked hard to manufacture a new identity. These women often become mini-mothers to father and other siblings. They are expected to pick up the roles that the mother did previously. Faced with this kind of responsibility, they may become overachievers and become exhausted or may get into a bad relationship or run away. They have to grow up fast; they aren’t able to be a kid. All of the struggles of adolescence lead up to a very important life transition. At the end of adolescence, a developmental process takes place called “Individuation.” This is a normal part of human development when the adolescent separates from the mother and begins to form her own identity. If mother loss occurs at anytime before the end of adolescence, the individuation process is halted and does not take place. Our next blog will be dedicated to the Individuation Process, mother loss, and what that may look like in adults. This is eye opening. Don’t miss it! If you have experienced mother loss from the ages of 13-18, can you relate to any of these themes as an adult? How does this play out in your adult life? Where are you stuck? Are there ways that you act as an adult that connect with these themes? The exhaustion of keeping up the ‘everything is fine’ act hits eventually. Mine took 25 years before the cracks started showing. Still feeling fighting the demons 10 years later. No one gets it really. It is exhausting to keep up the everything is fine act. The challenge is to choose not to do that anymore. It takes lots of courage to lay it down. There are plenty of other women who “get it.” You are not alone. Heal the cracks. You cannot change the past but you can change the way you look at the past. Don’t know where you are located but want to make sure you know about the upcoming Journey Retreat for Motherless Daughters. Go to this link to find out more about it. http://www.motherlessdaughtersministry.com/?event=the-journey-retreat&event_date=2016-06-09. I think it would be insightful for you. You are not alone. I can do relate to this comment. It was 20 years for me. I started having panic attacks which was complete 180 to my happy and easy going personality. I now know that isn’t my personality. That easy going manner was part of me trying to keep the painful emotions locked away. I’m going on year 25 now and have been learning to accept those emotions and release them as they come. It is great that you have good hindsight. Sometimes we can’t understand until we look into the rear view mirror. Your words “accepting” and “releasing” tell me how insightful you are. We will always get triggered throughout our entire life due to ur mother loss. The emotions are a part of who we were, but they do not define who we are today. Keep in touch Marti and keep up the good work. I have spent most of my life trying to figure out who I am. I am fascinated with my mother’s history, which is mostly unknown or hidden, because I have hoped it would help me understand myself. In the last few years I have come to realize that my true identity is found in God, my Creator. But it still saddens me that I’ve spent most of my 48 years working on identity issues. You are so insightful and I believe you are correct. We work so hard but it is not in vain. It is quite possible that the 48 years you have worked on identity issues is part of the journey to finding your true identity. My mom died when I was 12. At 55 I think I’ve finally begun to grieve or at least understand. I felt unloved and not cared for growing up. I have beat the odds. I am successful and have 3 wonderful kids. Good for you! Give yourself grace that there will be times when you are triggered by an event. Grace and space to grieve in the moment. Thanks for sharing your success. So much of this fits me to a T. I was barely 20 when my mom died, but she was diagnosed with cancer when I was 16. She was the push behind my normal looking life—she didn’t want anyone to know she was sick, but once you lose your hair, it’s hard to hide, especially when you refuse to wear a wig. In college, those close to me knew she was sick, but not everyone, so when she died, they were all shocked. I remember my boss telling me he had no idea. Of course he didn’t, her illness didn’t relate to my work, so I never told him. To this day (almost 17 years later) I still struggle with wanting the normalcy of still having my mother, but it’s bit my reality. I do share more openly and have been able to walk beside friends through the grief of losing a parent earlier than they expected. My husband and I were also both able to relate better to his mom a couple years ago when her own mother died, helping her validate her own feelings of guilt and frustration, as many were similar to what I experienced in my adolescence. Please know that your mother loss is considered a double loss. It began at 16 when she was diagnosed and then you lost her again when you were in your early 20s. Kathleen, it sounds like you were a pretty normal adolescent. Adolescents need to “look” normal and fit in. When we lose (I say we because I relate to you my mother died when I was 15 of cancer) our mothers as an adolescent, we build these nice BIG walls around us. This keeps others away from us. We think we are protected. We do not have to be vulnerable, because after all, it might happen again. I have worked on taking my walls down but it is a lifelong challenge to be transparent and not hide behind the wall. Sounds like as you have walked beside friends and your mother-in-law, you too have had to learn transparency. Keep your walls down and when you feel as if you are beginning to lay new brickwork on your wall, email me. I will be right here. Hello my mother walked out on me when i was 13 and i didn’t see nor talk with my mother until i was 20. She is in my life but still keeps herself distance. She doesn’t call and when i call her she really doesn’t care to ask about me or my daughter. Im now finding that I’m having a hard time letting my daughter be a young adult without feeling hurt and alone. Im scared that I’m going to chase my own daughter from me by being over barring. Any advise? i always keeped to myself I have a husband for 24 years and i feel like my world is falling apart. Any advice? Kim, I only have questions and thoughts. How difficult it must be to be constantly rejected by your mother. Over and Over and Over again. The question I would ask you is what kind of boundaries do you keep in your relationship with your mom? Boundaries are really important to take care of yourself. Can you create them for yourself and stick with them? What do you want your relationship with your daughter to be? What does she want her relationship to be with you? If you have not sought out counseling, I would strongly suggest you do this. First for yourself. You have to dig deep inside and figure out who you are. You have to get a clear understanding of your role with your mother. You also have to get clear on your relationship with your daughter. Is it possible that the feelings that you had when your mother abandoned you are somehow connected to letting your daughter be a young adult. Is there a fear that she will abandoned you also? Go and talk to a counselor.